Let’s face it; almost everyone procrastinates at some point. But procrastination rarely serves us well. When you are procrastinating, you are only deferring action. You are also deciding to do another activity instead of the task at hand. So in a world where time is precious commodity, let’s explore some tools to fight procrastination during the workday. Diagnose the reason for the procrastination and take action against the cause. For example, maybe you don’t have enough information to complete the task. Acquire the information or enlist the assistance of someone who knows the information. Perhaps you feel overwhelmed by the task. Break it down into smaller steps and take the first step. Consider setting a timer for 5–10 minutes and just start the activity. When the timer goes off you will be that much closer to finishing the task. For instance, if I want to publish a book that was written and edited several months ago, but I haven’t because I don’t know how to get published, I can proceed in several ways. I can continue to hope for “red lipstick on the mirror” to tell me what to do. I can conduct a Web search on book publishing and then decide on a course of action. I can ask trusted business contacts if they have information or personal experience regarding publishing a book and then choose the next step. Only two of these approaches will bring me closer to my goal! 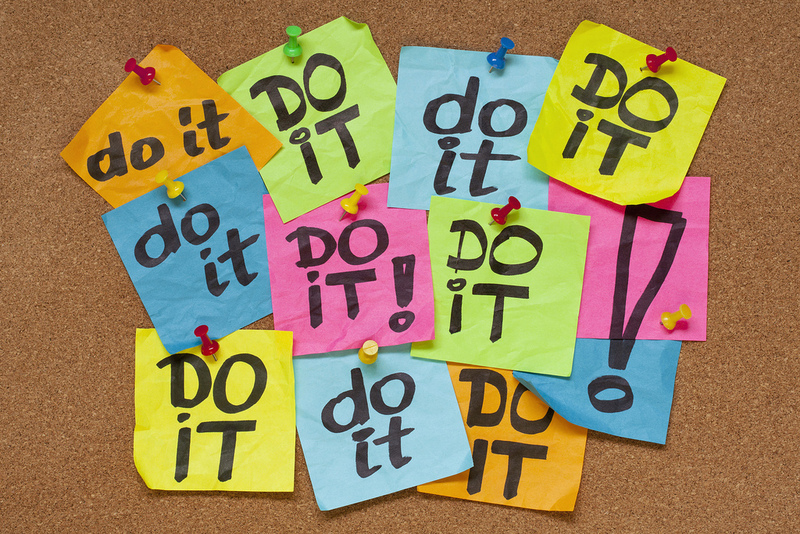 Your action: diagnose the origin of your procrastination and work to counteract it. Decide to work on difficult tasks during high-energy times. We all have to-do items that we really don’t want to do but that we know we have to execute. We can’t ignore them because there would be significant consequences. We can’t delegate them because there is no one to assign to the job. We tend to put them off to the last minute and at a point in the day when we feel tired. Then we wonder why the assignment took so long to accomplish and why we aren’t pleased with the result. Let me share a personal experience. As a business owner, I am ultimately responsible for all financial matters in my company. I have chosen to delegate many of the bookkeeping responsibilities and I have been trained in QuickBooks, but I do not enjoy the few accounting tasks I need to complete. I tend to delay these items until the last possible moment. As a morning person, I know that it is in my best interest to work on these accounting tasks in the morning when I am fresh rather than in the evening when I am tired. When I make myself open QuickBooks in the morning, I am able to get the job done more quickly and with less hassle than when I choose to wait until evening. Your action: define your most productive time of the day and decide which tasks should be carried out during this time. Determine your professional and personal goals. Is your to-do list three miles long? Do work and home demands pull you in too many directions? Many times we procrastinate because we are simply overwhelmed by number of tasks we need to carry out. In order to “declutter” the to-do list, we need to “delete” some items. The only way to drop tasks is to know your professional and personal goals and to recognize the priorities within each goal. For example, if I want to generate passive income from my business so that I can retire early and travel around the world while continuing to make money, then I need to make time for activities that support this goal. That might mean that I need to “say no” to volunteering for something I am interested in or think I would be good at so that I can make time to write a book. Your action: determine your goals so that you can delete tasks that don’t support those priorities. We all have tasks that we don’t like to do. Procrastinating only prolongs the agony. Stop the procrastination habit by diagnosing the problem, deciding to work on tougher tasks during your peak energy, and determining your goals.